Is your dog scared of the vets? Is your dog scared of the vets, or certain procedures at the vets? Is it difficult and upsetting for them, and for you? In our ‘Greet & Treat’ sessions, we put time and effort into helping your dog feel more relaxed coming in to the practice, and gently teach them how to accept and participate in particular tasks. Buddy was terrified of having his nails clipped. The video below is from his second training session, and shows him eager to play the game, rather than hiding under a chair. 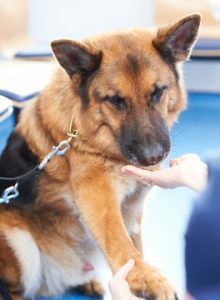 Please contact us if you would like to chat to one of our nurses about putting together a training program for your dog.